"You know, you could seriously die from that..."
"Compared to the other two, you're a little weird." Episode 3: Sasuke and Sakura: Friends or Foes? Episode 3: Sasuke and Sakura: Friends or Foes? The above info came from Spazzter and Sasuke Lover, and was edited by yours truly (contact me). The image came from FREAKY EYE. 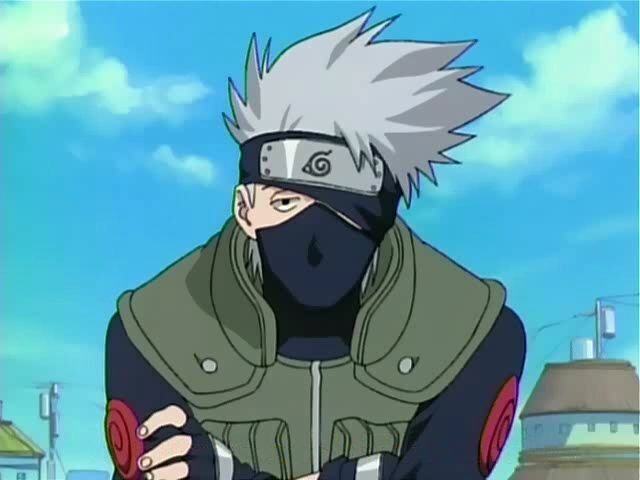 Kakashi is one of the Hidden Leaf Village's "Jounin" (elite/top-level ninja), and Team 7's trainer/teacher. He wears a ninja mask covering his face up just below the eyes and wears his headband skewed on his head, covering his left eye. At first Naruto, Sakura, and Sasuke think he's not much of a teacher nor ninja, but when Kakashi places them under his "Survival Training" course, the three "Genins" (rookie/first-level ninja) realize the value of teamwork in getting the mission done. 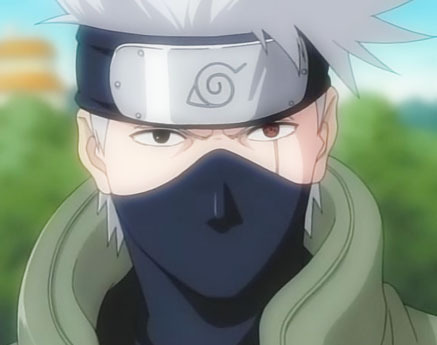 Kakashi's unique ability is the use of the "Sharingan" in his left eye. It is an ability unique to the Uchiha clan (Sasuke also has a weaker version of this ability), yet Kakashi is not from Uchiha. The "Sharingan" allows the user to copy and predict the movements of any genjutsu or ninjutsu technique used against him (except for bloodline trait techniques). Of course, you would have to SEE the ability/technique first in order to copy it. Since Kakashi is not of the Uchiha clan, using the Sharingan strains his body. When Kakashi graduated as a jounin, his teammates had to give him a present, but Uchiha Obito forgot. They also had to do a mission on the same day. On that mission to the grasslands, they got attacked by a group on rock ninjas. The rock ninja's can turn invisible, and slashed Kakashi's left eye (that's how he got the scar). Later, Uchiha Obito gets his whole right side crushed by a huge rock thrown by a rock-ninja. With the last of his strength, Obito tells Kakashi to take his left eye as he will no longer need it. So then Rin, with her special ability, transplanted Obito's eye to Kakashi. During the timeskip later in the series, Kakashi develops his Sharingan into the Mangekyo Sharingan, which is basically just an enhanced version. 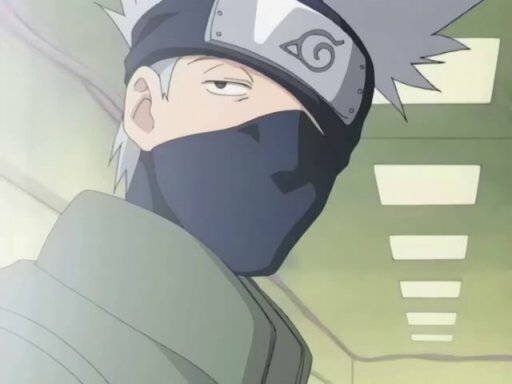 Kakashi is not without his "lighter side", though, as one of his "quirks" is reading some kind of adult books titled "Icha Icha Paradise" and "Icha Icha Violence". Nothing, not even survival training, can stop Kakashi from reading through the pages just to "see what happens next"! Oh, and the reason Kakashi is always late is because his best friend, Obito, was always late, and he choose to adopt his old friend's habit. Unfortunately, Uchiha Obito's body was never recovered, so instead of a grave, he visits a large stone monument that serves as a memorial for all those who died for the mission's completion. Kakashi's name literally means "scarecrow". Ichya Ichya Paradise was translated to "Make-Out Paradise" in the US version of SHONEN JUMP, but would be more closely translated to "Come Come Paradise" or "Flirting Paradise". Additionally, "Icha Icha Violence" was translated as "Make-out Violence". I'm also told that Kakashi reads another book/magazine, "Icha Icha Tatics". 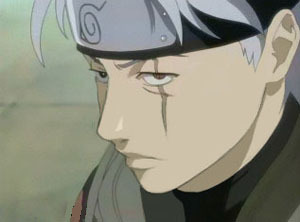 A while back some fake pictures of Kakashi without his mask surfaced. These fake pictures are edited versions of real pictures. The above description came from Spazzter and valerie castano, and was edited by yours truly (contact me). 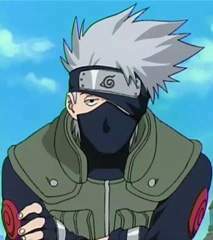 Hatake Kakashi was the jōnin assigned to train Naruto, Sasuke, and Sakura for their real ninja education. He was chosen... because he has a talent for sniffing things out, whatever that means. He's a cool looking guy that looks sort of like a slacker. I love his attitude, since it's sorta similar to the way I act. He is very quick and is very good at ninjutsu. How good? Good enough to read a book while he's fighting, providing that the fighter isn't as good as Sasuke. However, he seems to have a strange taste in the reading matter. Weird guy, and I'm not asking. He's extremely strict, and has never passed anyone before, until Naruto, Sasuke, and Sakura came.... He seems to empathize on teamwork, and had purposely made a test with instructions that would make them want to work separately. Afterwards, he gives them another chance, and tells Sakura and Sasuke that they may eat their lunch, but they cannot give any to Naruto after he attempted to steal them. However, when both of them gave their lunches to Naruto.... They passed! Kakashi's a really strange guy.... I like him, he's funny. Kakashi possesses one sharingan eye. I repeat, one. This mirror-wheel eye allows him see through illusions and spells, and reflect those powers used to create those illusions and spells back at the one who cast them. It also allows him to discern and copy an opponent's moves. Normally, he keeps his eye covered with his headband (for reasons that you'll find out), and if he exposes his eye to fight an opponent... you know the opponent is going to be tough. Kakashi got his sharingan eye from a friend, a member of the Uchiha clan. Kakashi, Rin, Obito and Yondaime were on a mission, and Kakashi had become a jounin on his birthday so Yondaime made him mission leader and went off to help fight a part of some massive war. Then during the mission Rin got captured, but Kakashi did not want to go and get her (the reason for this is because his dad, the White Fang of Konoha, did the same thing and became a disgraced ninja and killed himself). Obito then went off to get Rin back since he has a similar attitude to that of Naruto, and as he fought the guy that captured Rin he awakened his Sharingan... then Kakashi comes around to join the fight ('cause Obito gave him a speech beforehand) and long story short they win the fight but the guy they were fighting (an Iwagakure shinobi named Kakko) did a rock slide move ("Doton: Iwayado Kuzushi", AKA "Earth Release: Rock Lodging Destruction") to take 'em out. Since Kakashi couldn't escape in time, Obito pushed him out of the way, but Obito then got caught under Rock slide. With half of his body crushed (namely the right side) he pledged his awakened sharingan from his left eye to Kakashi, and Rin (a medical ninja) performed the transplant for him. Kakashi then goes to fight the idiot that killed Obito with his newly acquired Sharingan, and Chidori (AKA One Thousand Birds), a move he had just recently invented. So Kakko ends up having the honor of being the first person to be killed by Kakashi's Chidori. And now that is why Kakashi has a sharingan. Also, that is why his "2 bells test" highlights friendship and team work, as he felt if he had made it there earlier Obito wouldn't have died. The above description came from Hatako Kakashi II and kd, and was edited by yours truly (contact me). The image came from Sabaku.net. Kakashi became a Chunin at age 6, a Jonin at age 10, and an ANBU at 13. The fourth hokage was in charge of Kakashi's team. 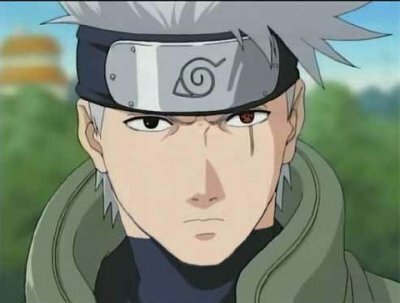 The scar on Kakashi's left eye came from a battle with the rock ninja. 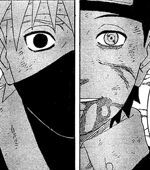 Kakashi jumped in front of Obito to save him from the enemy's kunai, and thus Kakashi ends up with the scar. Obito's sharigan eye only had two stages when he gave it to Kakashi. Kakashi's sharigan eye has three stages, showing that Kakashi has evolved it into its third stage. Kakashi also has an ongoing rivalry with Maito Gai. Kakashi has 49 wins and 50 losses against Gai. However, the battles include sprints, and Rock, Paper, Scissors. The above description came from Brandy, and was edited by yours truly (contact me).